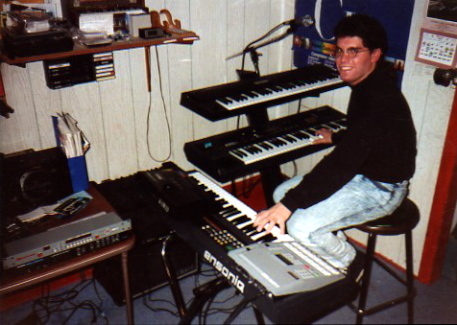 Me at my keyboard rig around 1990. “Time Takes Over” features sounds from the Roland U-20 synth on the top tier of my Apex stand (over the Ensoniq ESQ-1 on which I have my right hand). “Time Takes Over” is the first complete song I ever wrote. I was 17 at the time and it was strangely inspired by a co-worker of mine at the time who was only a year older than me, but had the personality and outlook of Archie Bunker. Anyway, we worked at what is now a long-gone Pizza Hut in Point Pleasant, N.J. It was summer 1988 — in between my junior and senior years of high school — and the older sister of one of my classmates got a summer job as a cook/server/hostess with us. I had known her brother for years and knew her a bit, and never would have imagined her wanting anything to do with my overtly racist, sexist co-worker. But they wound up hooking up that summer. Of course, she went back to college in the fall and since our business dropped like a stone when the summer tourists left, that left a lot of downtime for my co-worker and I to talk. And, for the first time, he sounded human. He really did care for her. Shortly after she returned to college, my co-worker went to visit her. He expressed to her how he wish they had more time together, and — this is what he told me — she said to him, “Well…time just takes over.” And, at that, she suggested to him they just stay friends. So, that’s the story behind this song. And it’s weird that one of the most stoic people I have ever known opened up his heart to me and inspired what I think is a pretty emotional song. Anyway, the following summer he hooked up with another summer Pizza Hut employee and wound up marrying her (even though my classmate’s sister also came back to work with us that summer…which was awkward). I’ve Googled the guy in the past — and just did before posting this — and it appears he’s living in central New Jersey and married to the woman he met at Pizza Hut in 1989. But I haven’t seen him since the early 90s…well, except for one time when I drove by him when he was a cop in a Jersey Shore town a few years later. Regarding the song itself, most of the instrumentation you hear on this track is from a cassette of the original instrumental demo I recorded in October 1988 using sounds from my old Roland U-20 synthesizer. It wasn’t until a year or so later that I got around to recording the vocals, but by then the arrangement had changed a bit (so I spliced and rearranged this a bit to fit the finished version). I recently added the vocals, wind chimes/shaker track and augmented piano/bass parts to this version, so I would have a complete recording of the original version in time for the song’s 30th anniversary in October. Now, obviously, this milestone means nothing to anyone but me. My music career went nowhere, and I’m not really a musician anymore except for when my friend Christian Beach* needs me to be one or when I’m inspired and motivated to compose/record something. But I’m still proud of this song. I’m not sure how many 17-year olds were writing songs like this in 1988, but it couldn’t have been many. I mean, at its base, it really is a bubble-gum song about young love that is ultimately unrequited. But it sounds and feels so much bigger than that. *Speaking of Christian, during our time in a band together from 1989-91, we actually played “Time Takes Over” in one of our live shows. Here is video of that performance (from 1990? ), which features my trying — and mostly failing — to sing with a terrible head cold. And here is the most recent update of “Time Takes Over.” I recorded this version in 2016.